The Swiss nation has always held the sport of shooting in high esteem. Those partaking of shooting sports, of all disciplines, are understood to be perfectly normal, socially acceptable and patriotic persons, rather than the near pariahs with violent or warlike tendencies that they might unjustly be considered in some quarters of the World. The Swiss Government has, for decades, considered that every national should take part in the sport with a view to ensuring the security of the nation in the event of any outside aggression. A significant resulting additional benefit to this train of thought has been the internal security of the country. All young Swiss subjects are brought-up with firearms, and develop the associated discipline borne of correct training and an everyday familiarity with both military weapons and target arms. National Service, which each young adult is required to undertake, furthers this character building and the individual's self discipline. The nett profit from this, apart from the Swiss nation's acknowledged ability to remain uninvaded for centuries past, has been the lowest level of firearms crime almost anywhere in the world, (their crime statistics in this area are the best of any nation where firearms ownership is readily available to the population - and far better than some places where it isn't!). Nationals involved in training, or otherwise serving in the various aspects of the military and volunteer forces, may keep their service arms at home so that they are readily accessible both in an emergency and on the frequent occasions that the opportunity arises to shoot for target competition or training purposes. No better example of how firearms possession and public safety can go hand in hand exists anywhere. It is never simply what you do that counts, but the way in which it is done! The Schmidt-Rubin rifle has been the main-stay of the Swiss military since the Nineteenth Century. In later guises it is today still to be found in service of some manner or other, even if only as a semi-retired training arm. Small-bore conversions were made, both of the turn-of-the-Nineteenth-Century long rifles and, earlier in the Twentieth Century, of the carbines. We show examples of both on this page. ( Long rifle images to follow). Below are images of a .22LR rimfire converted 1911 carbine. The rifle therefore retains the "mighty" bolt of the full-bore parent arm; a straight-pull arrangement not dissimilar to that of the Canadian Ross rifle. ( See the straight-pull Ross Cadet Rifle). For anyone unclear as to the meaning of the term "straight-pull", it simply refers to a bolt opening and closing system in which the bolt handle is merely drawn or pulled straight backwards and pushed forwards to respectively open, or to close and lock, the action for loading. The more usual of bolt-actioned rifles require that a turning motion be applied, to the bolt-handle, to lock and unlock the bolt to to or from the action on opening or closing. The Ross rifle and the Swiss Schmidt-Rubin rifle are the most well known designs of this nature. 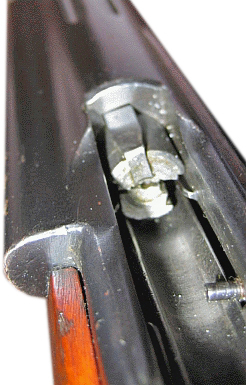 With both the Schmidt-Rubin and Ross full-bore service rifles, the main body of the bolt has a machined part-helix which permits the fore and aft movement of the bolt within the action, whilst at the same time imparting a rotating motion to the component of the bolt which spins to lock the action for safety in firing. With the Schmidt-Rubin, an outer sleeve over the bolt-body carries the locking lugs, the whole sleeve rotating about the bolt-body and bolt-head components. The Ross utilises a similar technique, but the forward threaded locking lugs are part of the bolt-head, which itself rotates, engaging with an interrupted internal thread in the breech of the action. The small dimensions of the bolt for the Ross Cadet rifle do not permit such complexity, and that rifle, whilst emulating the straight-pull of its big brother, has a simple locking arrangement possible by virtue of the low pressure combustion of a small-bore rimfire cartridge. 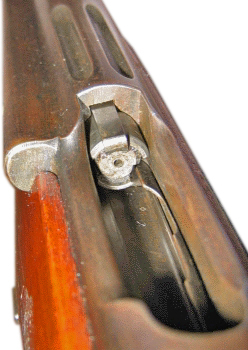 Below: top; the early 1889 full-bore long rifle. 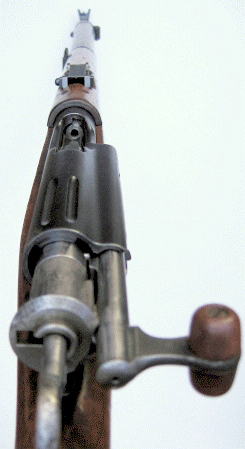 Bottom; the 1911 (Karabiner 1911) carbine converted, by sleeving the barrel, to .22LR rimfire for small-bore training use. Below: the full-bore bolt-head, and.................................. the small-bore bolt-head. The bolt viewed from above .............................................. and below. Below: the firing-pin (striker) arrangement. and the Left and RH sides, the same! No recalibration has been applied for the miniature calibre ammunition. but you can also view the .22RF K31 training carbine. The last of the line of this straight-pull design was the ZfK 55 rifle, which was also used mainly as a sniper's weapon. The rifle was adopted in 1956 to replace the M31/42 and M31/43. They were manufactured between 1957 and 1959 at Eidgenoessische Waffenfabrik, Bern, Switzerland. the year in which were manufactured almost two-thirds of the total production of 4150. Being of 7.5mm calibre, the rifle chambers effectively the same Eduard Rubin's designed 7.5 x 55 (GP11) cartridge as its predecessors. Illustrated below with the separate 3.5 x magnification telescopic sight on its mount, and with its transit tin case. 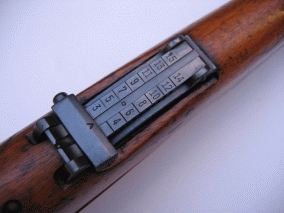 The mounting blocks on the rifle are integrally machined as part of the left-hand side of the receiver. With an overall length of 47.55 inches, the rifle weighed 13.5lbs with scope attached, and without ammunition. The slim-line magazine, which can be removed, has a capacity of just six rounds. The fold-down bipod pivots from beneath the front of the action, and is of considerable height. over a ridge of ground rather than prone on a flat surface. The barrel has a length of 25.65 inches, with only 4-groove concentric rifling, with a right-hand twist of 1:10.63. Of not dissimilar appearance to the K31, the ZfK55 differs with its half-stocked wood furniture with a pistol-grip, and has only four common components. These are the the cocking piece, the firing pin, the firing pin spring, and the extractor. Instead of the upright configuration of the K31's action, the ZfK55 rifle's action is cleverly tilted. permitting clean ejection of fired cartridge-cases clear of the underside of the 'scope. Below: the scope viewed from above. The turrets are calibrated in single figures denoting hundreds of metres. The tangent rear-sight leaf is calibrated from 100 to 1500 metres. The barrel is fitted with a flash-hider that probably also has a small recoil-reducing effect; a typically complex Swiss component of thorough design. It is fixed in position by a locking wheel that rotates withing the fore-sight block. Even without the flash-hider, the ZfK55 barrel is slightly heavier than that of the K31. The ZfK 55 rifle was taken out of regular service in the 1970s, with the introduction of the SiG 500 series of automatic rifles.